The Edo Period (1603-1868) presents us with a great paradox. While severe restrictions were placed on almost every aspect of life (travel, religion, choice of occupation, etc, etc,), there was at the same time a marvelous flourishing of culture. Among the more famous representatives of the unique arts that arose in that time (and are still with us) are: haiku poetry, woodblock prints (UKIYO-E),and the Kabuki and Bunraku (puppet) theater. Less well known, but no less impressive, was the flowering of the horticultural arts (uniquely popular among warriors and commoners alike!) – and it was a real craze – with the publication (over the years) of excellent manuals, the creation of hundred of varieties of certain favoured plants: camellia, peony, chrysanthemum, iris , adonis, morning glory etc, the creation of regular and very popular flower markets (which are held to this day) – and most importantly, an appreciation and enthusiasm among the general populace of the beauty of flowers. 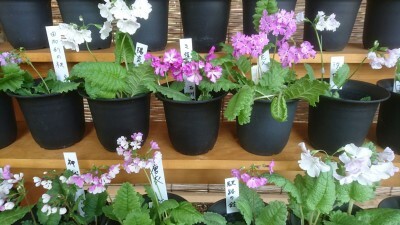 One of the favorite flowers of the Edo Period (and beyond) was the SAKURASO- (桜草) – the primrose, which is found in Japan, Korea, and northeastern China. 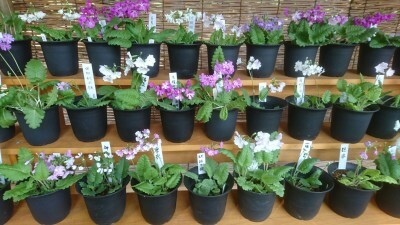 About 300 varieties were developed by enthusiasts of this plant – all from a single variety originally found growing along the banks of the Arakawa River in Edo (now Tokyo). One of the interesting ways in which sakuraso- were enjoyed was by having them suspended in a translucent gelatine called kanten! Sakuraso- (桜草) – in many colors shapes and sizes – creations over the centuries of Japan`s floriculture enthusiasts. You can see many of these variation on that single flower – on display at the Tsukuba Botanical Garden. 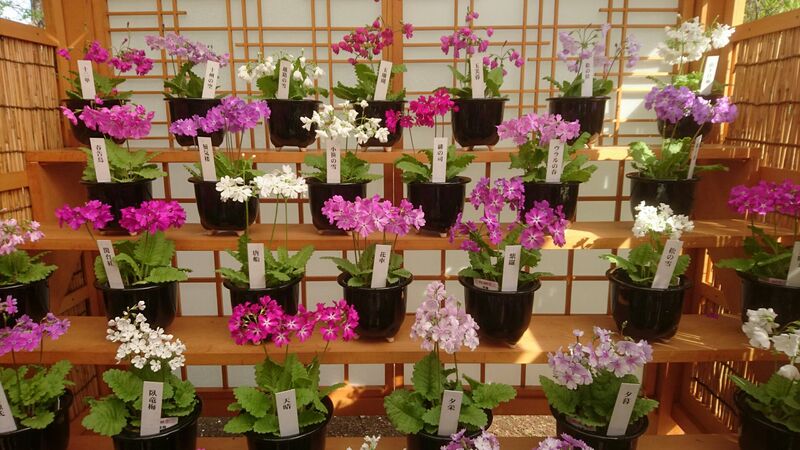 Even more than discovering all the colors and shapes that have been somehow tweaked out over the generations – it is the excitement of the visitors that is of real interest (to me, at least) – a clear connection with the Edo Period and its horticultural mania! And this being mid spring – the precincts of the botanical garden offers much more beyond the primrose, which are located just past the entrance hall.